If you're in the market for a new sofa, chances are your criteria is pretty simple — it must be comfortable without skimping on style. Enter: velvet couches. Plush cushions, luxurious upholstered fabric, and chic details (think: gold legs, tufted backs, and jewel tone hues) ensure that velvet sofas are not only a stunning centerpiece in any room, but they're also sturdy, comfy, and cozy enough to perch on with a cocktail during a dinner party, curl up for a movie night, or to host overnight guests. 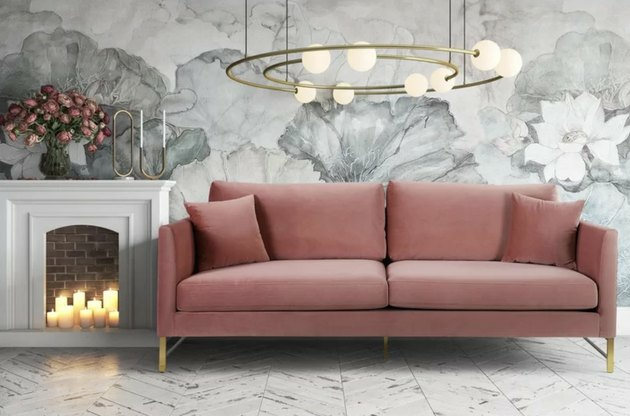 Believe it or not, while they may look pricey, you do not have to break the bank to bring home the velvet couch of your dreams. We've done the homework for you and rounded up 12 sophisticated velvet sofas that ring in under $1000. 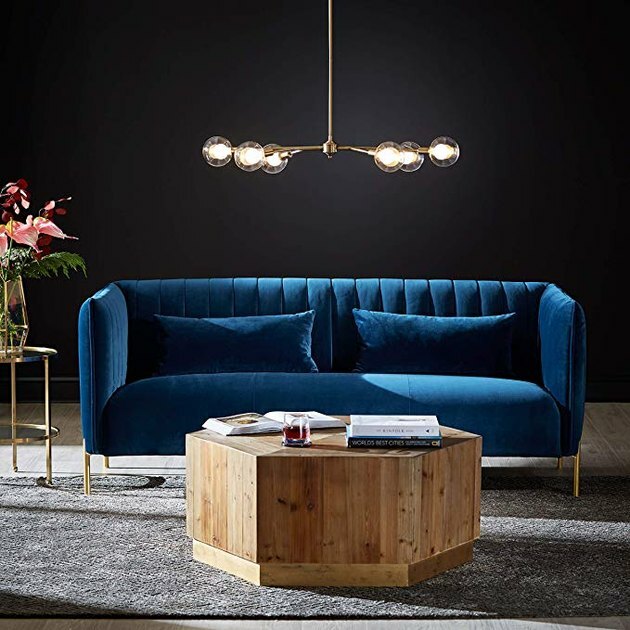 Midcentury modern meets glam in this stunning sapphire blue velvet couch. The best news? It only takes 30 minutes to assemble, so you can update your living room in no time. 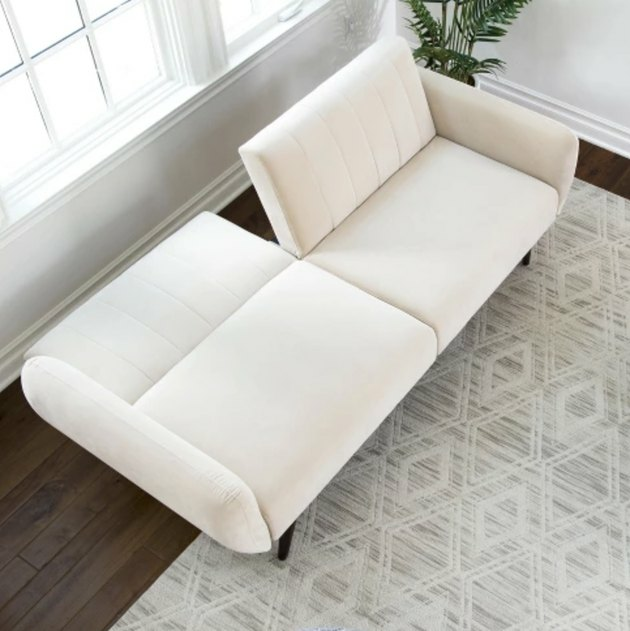 A neutral ivory couch fits seamlessly into any room, and this chic sleeper sofa (read: not your college futon) boasts plush foam cushions and luxurious soft velvet, ensuring any overnight guests a great night's sleep. 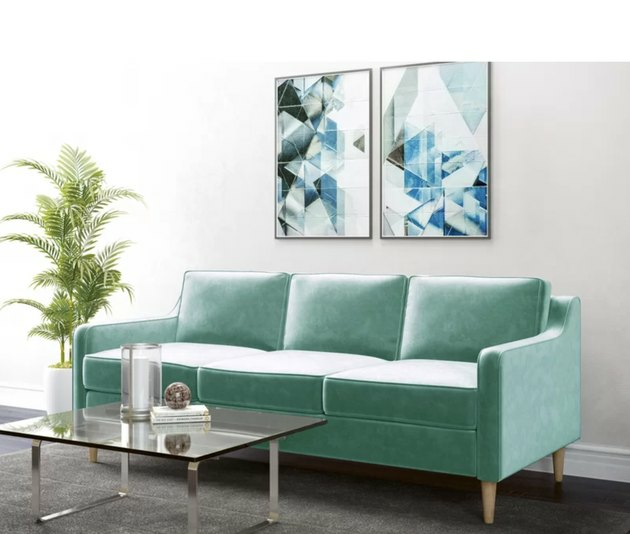 This pretty upholstered velvet sofa has a solid eucalyptus wood frame and is filled with memory foam, which means it's comfortable and durable. Bonus: It comes in statement-making colors like sea foam green, royal blue, and blush pink. 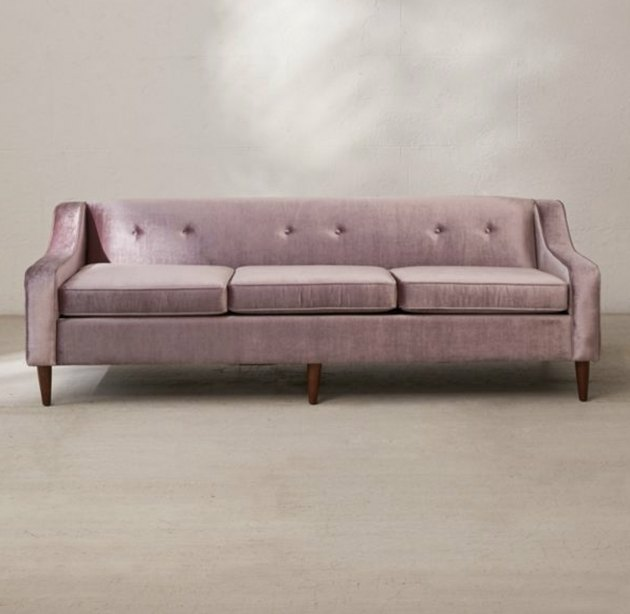 Set on goldtone stainless steel legs, this comfy couch comes in rich gray and rose velvet and will sophisticate your space immediately. What's also great is that it comes with two coordinating throw pillows if you want a monochrome look. If you love midcentury modern style, this velvet loveseat checks all the boxes. It has vertical tufted channels on the interior, slender angled legs, and supple velvet fabric. Perfect for small city apartments or the sunroom of your house, this retro-inspired loveseat packs in a lot of personality without taking up too much space. Plus, it comes in a range of beautiful colors, including gold, lavender, green, and more. High-end appeal at a price that won't break the bank? Here's our credit card. We love the chaise lounge for stretching out comfortably at the end of the day. 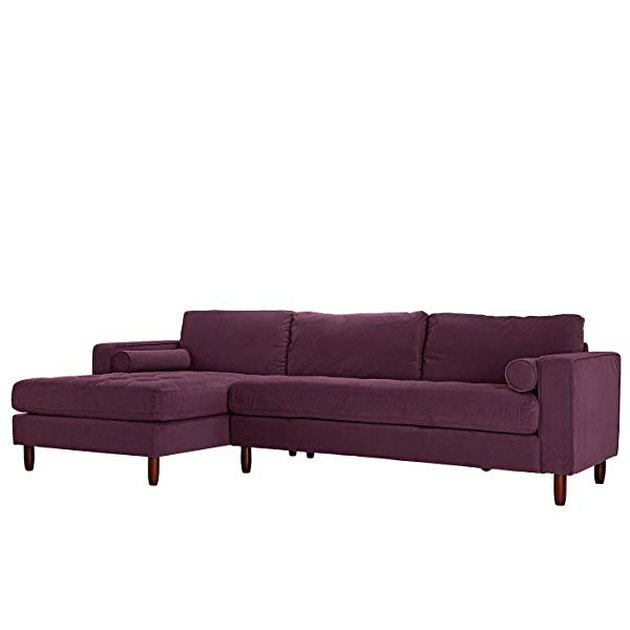 Just pair this plum-colored sofa with a neutral or Moroccan rug and some indoor plants and you'll be #apartmentgoals. 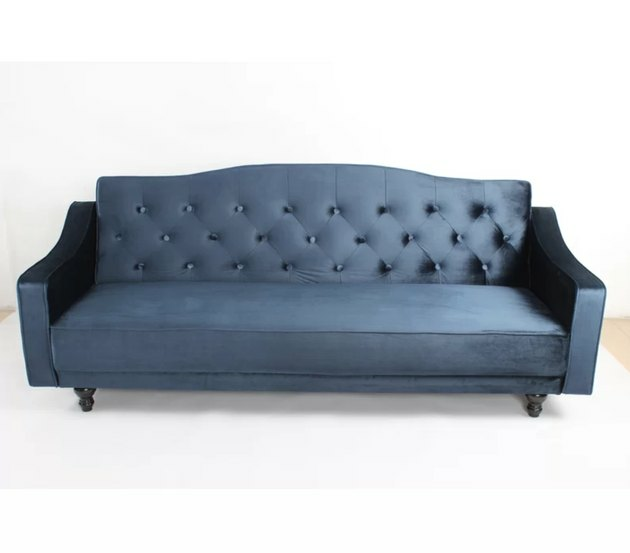 Great for cocktail parties and movie nights, this sleek, antique-looking velvet couch seats three comfortably and can even be converted into a queen-size bed for out-of-towners. Pick from classic blue, gray, green, or camel. 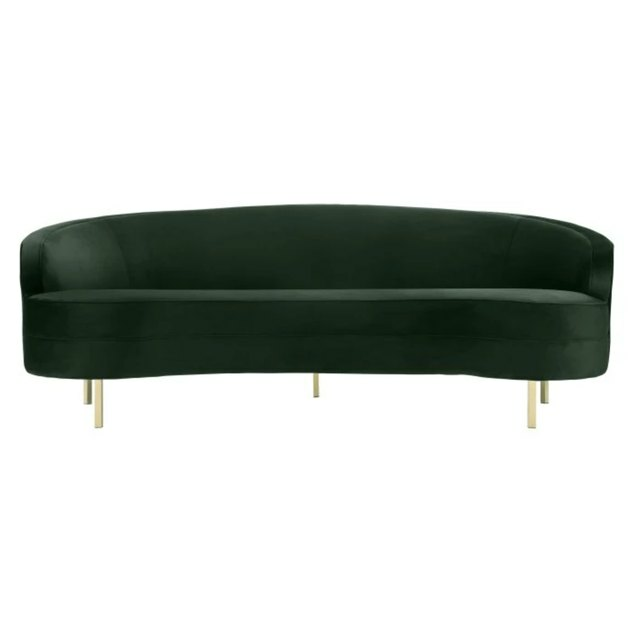 This minimalistic curved velvet couch is the ultimate centerpiece to any living room, and is available in rich green, navy, and gray. Another perk? You can order complimentary swatches to guarantee it's a perfect match for your space. Goldtone steel legs, sleek velvet, and matching toss pillows — what more could you want? This velvet sofa is a no-brainer, and would look amazing in an office or in front of your fireplace. Vintage Victorian estate sale couch or total steal you picked up from Urban Outfitters? No one will ever know. 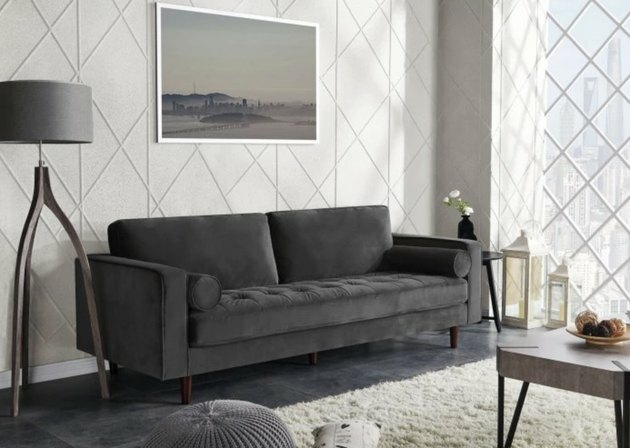 Made with removable tapered wood legs and a tufted, low-profile seat-back, this velvet sofa has clean, curved lines and comes in a variety of shades, like lavender, burnt orange, deep green, and charcoal gray to complement any room. 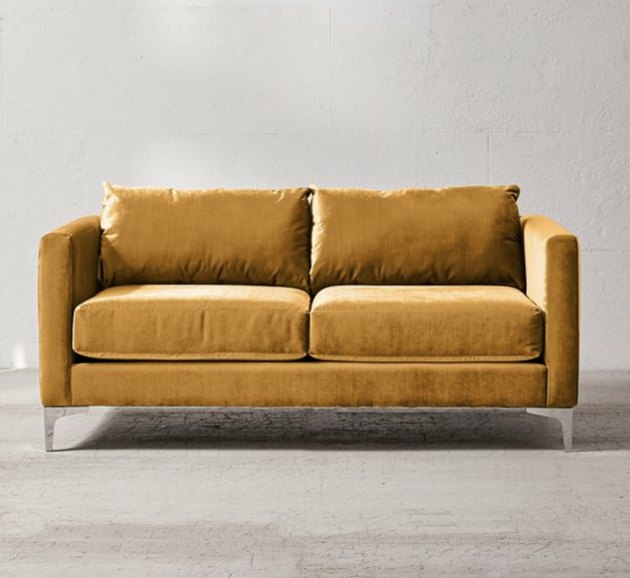 Soft velvet upholstery, high-density foam cushions, walnut-finished legs, and button-tufted seats make this chic couch a standout piece at an affordable price. Plus, it comes with two circular bolster pillows to complete the look.